Get Vendio Gallery - Now FREE! Opal is from the Lightning Ridge mining fields in. Want to see a video of this opal? Video will open in your default media player. You can then play the video from your hard drive. To loop playback on Windows Media player, press CTRL+T whilst the video is playing. NOTE: Video is designed to demonstrate colour play only. Whilst every attempt has been made to represent the opal accurately, base tone may not match actual opal. The colour play in this opal is saturated with the richest, bright colour. Lovely bottle green, gold green, several hues of turquoise all moving over a dark blue purple hue. The colours jump across the face of the opal in large rolling flashes with a constantly changing play of colour. A stunning and beautiful gemstone, ready to be made into a gorgeous piece of fine jewelry. 14.7 x 13.6 x 3.4 mm. Note: Great in all lights. The opals we sell are natural SOLID opals and have not been treated or enhanced in any way. This is the scale of brightness used to show the brightness of an opal. This is colour of the opals body tone; it can be black, dark (semi-black) or light opal. N1 is jet black through to N9 which is white. 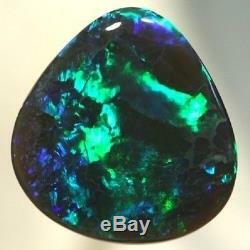 The item "ATCF5916SOLID BLACK CRYSTAL OPAL All greens SEE VIDEO" is in sale since Thursday, April 28, 2011. This item is in the category "Jewelry & Watches\Loose Diamonds & Gemstones\Loose Gemstones\Opal\Other Opals". The seller is "aussietreasurechest_opals" and is located in Down Under. This item can be shipped worldwide.